Transform the way your closet looks with the simple addition of closet storage systems. This easy to install and useful update will serve you well for many years to come. Our showroom is stocked with a number of options to accommodate everything from walk-in closets, mudrooms, entryways, highly functional pantries, craft rooms, and utility rooms. With our large selection of closet systems as well as cabinets, we have the storage solutions you need for your home. Store and organize your belongings by creating a clear organizational system with closet inserts from our meticulous designers. Decreasing clutter in your home can give you a feeling of being organized and ready to deal with whatever your household needs. With our help, you can be free from the pressure of searching through your closet on a daily basis to find the item you are looking for. Our team members are qualified to help you find the right closet organization solution, whether you need shoe storage, want to organize clothes, or plan on showcasing your accessories. Experience the immediate benefits of an organized life after we install your closet inserts. The first benefit you will notice is that your closets feel bigger without you needing a complete home renovation for the project. You don’t need to cut into your bathroom or bedroom to increase closet space with the right organization systems. Your new system will prevent you from wasting time looking for things. Finally, your home will look and feel tidier once your closets are in order. The expert technicians on our team always work under the motto of measuring twice, cutting once. When we are installing a custom system, we make sure you are getting a closet with full functionality due to our quality work. Our shelving will be secure, our drawers smooth, and our cabinets lined up with every job completed. Whether you come to us for closet insert installation in one reach-in closet or throughout your home, our installers make sure the project is done right. 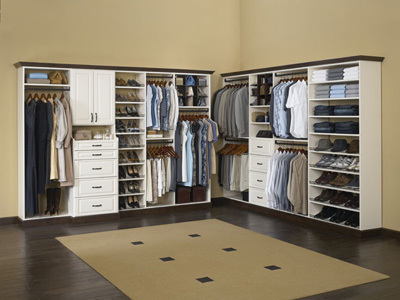 Make a change that maximizes your closet space when you contact us for closet organization assistance. We are proud to serve clients in Chandler, Sun Lakes, San Tan Valley, Gilbert, and Tempe, Arizona.